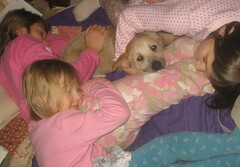 The girls of the Gaggle of Girls love dogs. We have 2 dogs, both of whom are good with the kids, and one that loves playing fetch with tennis balls and frisbees. But yet they begged for a new dog and/or a puppy regularly. We check out breed books and research training techiques, but there’s nothing quite like a real puppy. Imagine the joy when I got a puppy for my birthday! For those of you who also have dog and puppy-loving kids, weve found two great puppy/dog themed picture books that you’ll love. We love Amy E. Sklansky’s books, including The Duck who Played the kazoo, so we were thrilled to find From the Doghouse: Poems to Chew On. We’ve loved the Fancy Nancy books by Jane O’Connor (as well as her adult novel), so we were eager to read The Perfect Puppy for Me. Both books celebrate the joy of dogs and puppies in a unique way, and in a way that will enchant the adult reading the story as well as the listening kids. From the Doghouse: Poems to Chew On is a collection of dog-themed poems by Amy E. Sklansky, and illustrated by a team of 4 beaders: Karla Firehammer, Karen Dismukes, Sandy Koeser, and Cathy McQuitty. Each page has a poem, often one that will make you grin. Each of the poems is beautifully illustrated by using small beads on fabric to create an image. The poems are in a variety of styles, which encourages the inner poet in children by making poetry so accessible. Each illustration took 40-120 hours, a lot of work, and with an end result that makes a huge impact! Please scratch between my ears. And ease my dogy fears. The mix of sweet and funny poems plus bead-iful illustrations makes From the Doghouse a great read. Even if you’re leery of poetry, give this a try! Sklansky writes poems that are really enjoyable and accessible, this is a fun read for the adult as well as for the kids! Jane O’Connor and Jessie Hartland teamed up to write The Perfect Puppy for Me, with Jessie Hartland also providing the illustrations. This book is about a boy who loves dogs as he looks at the dogs around him, trying to find the perfect dog/puppy for himself. (A warning to parents – the boy is getting a puppy for his birthday – be prepared with an answer about puppies and your own child’s birthday!) Each two-page spread is about one of the dogs the boy knows, each one highlighting a different breed. When looking at the dogs and breeds, you learn the pros and cons of each type of dog, and why a certain breed may or may not be the perfect dog for your family. (They don’t include the type of dog in our family, though – Australian Cattle Dogs. My daughters were excited to learn the little tidbits of information and trivia on the pages, and found some of the listings very funny. For example, when talking about his friend’s basset hound, the boy says, “Here is what Poker likes to do: sleep, nap, snooze, rest”. The assessments of each dog breed seem very accurate, and my girls quickly realized that some breeds would be a better fit for our family than others. Now that we have a puppy, they are especially curious to know the answer to a question posed by the book, is there a dog tooth fairy? The combination of cute illustrations, real breed information, and a story where the boy gets a puppy at the end made this book a winner in our family! If your kids love dogs and puppies, and you’re looking for picture books youll enjoy reading, pick up The Perfect Puppy for Me and From the Doghouse. If you get a new puppy, good luck! You might also want to pick up How to Talk to Your Dog, by Jean Craighead George and illustrated by Sue Truesdell, a good read that also has some really useful information, and is one of the best non-fiction puppy picture books I’ve seen. Go enjoy some puppy books with your favorite puppy lover!